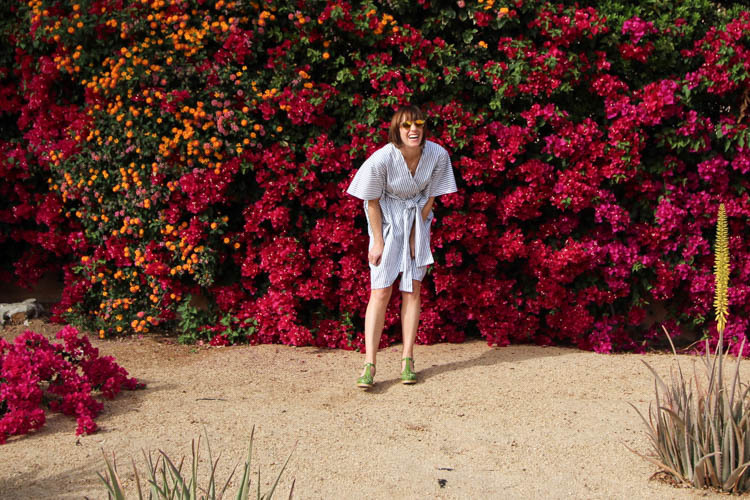 While I was in Palm Springs last week I drove past this bright, beautiful floral wall. 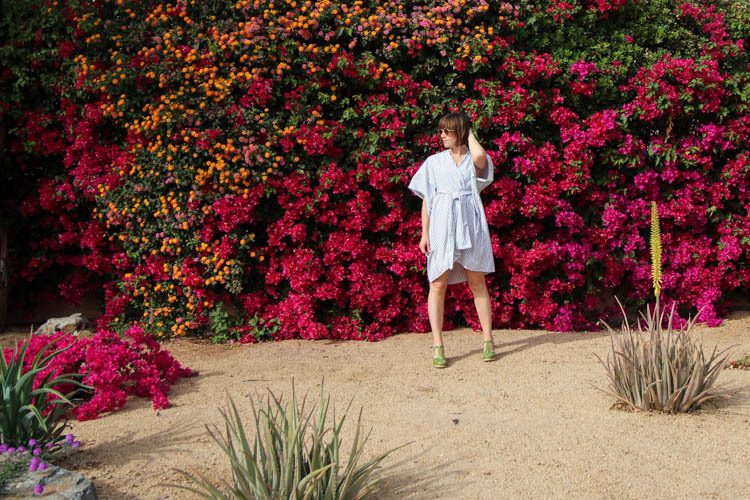 I suddenly remembered that last spring, on a girls trip, I had taken a bunch of photos in my then-new cross front kimono dress. I intended to post this tutorial months and months ago, and somehow I missed it! One benefit of the delay is realizing that I still love and wear this simple cross front kimono all the time. 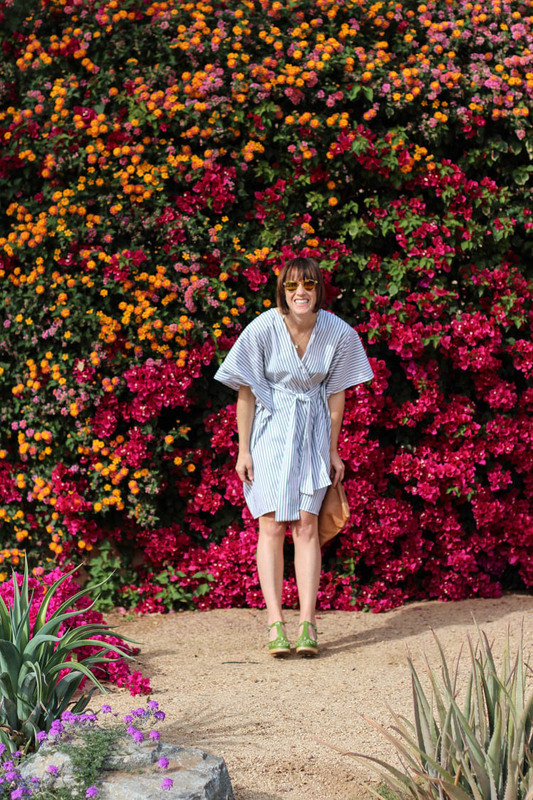 This versatile kimono can be worn with the belt inside, letting the back loose. This is my favorite style to wear it. It also works perfectly as a swim suit coverup in the summer. In addition to those styles, I occasionally tie it up tightly and wear it out as a dress with heels or wedges for date night. 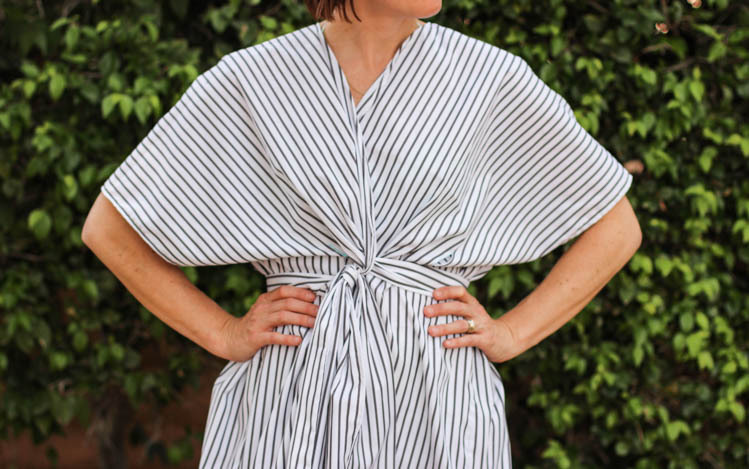 I love the simple lines, beautiful drape, and the easy way it fits. It feels like a cool, modern style and I have received compliments on it over and over again. I plan to have a piece like this in the shop soon, made from some beautiful hand-dyed indigo fabric. The wide, dolman sleeves have such a great vibe. It’s nice to be able to slip the dress on with a shirt beneath it for a layered look, or wear it on it’s own. Although, I never really have gotten into kimonos as layers. Living where it is so hot most of the year, I appreciate a piece of clothing that is an all-in-one outfit. It’s kind of fun to be sharing these kimono photos from a whole year ago and look basically the same. I think this is the longest I’ve ever maintained the same haircut, and I’m not getting tired of it yet. That’s a good sign. 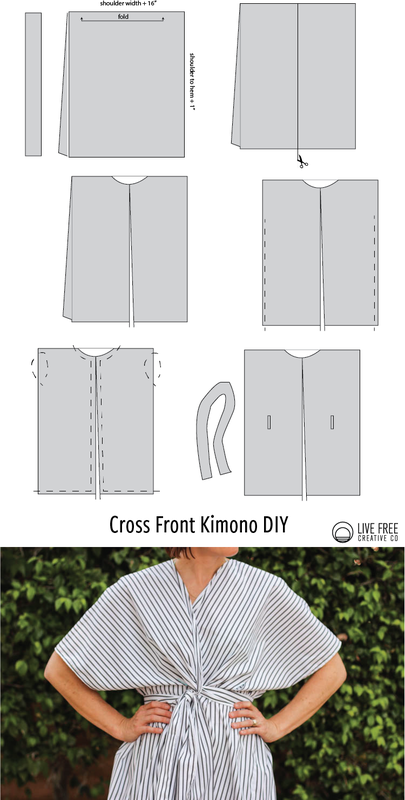 I’ve included an illustrated tutorial for the cross front kimono below. It is a pretty simple project and would be perfect to whip up for the upcoming spring break holidays. I’ll definitely be packing mine to Cuba, where I’ll be spending some time in March. 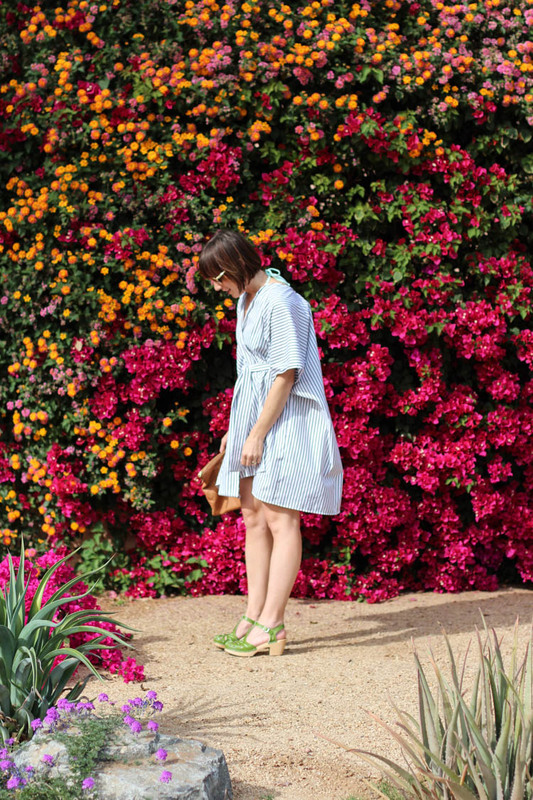 Grab your favorite lightweight fabric and get sewing! 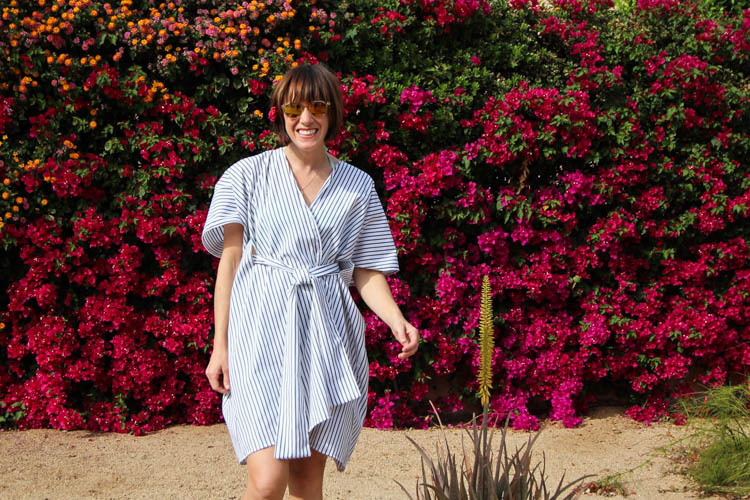 While you have the sewing bug, this post shares five other simple summer dresses to make for yourself this spring. Enjoy! Measure from shoulder to shoulder and add 16 inches to get the fabric width. Measure from shoulder to desired hem length and add 1 inch to get the fabric length. Multiply by two, so that the shoulder seam is on the fold. Cut a length of fabric 8 inches by 60 inches. Fold in half lengthwise and stitch along two edges, turn right side out. Stitch the open end closed, then press flat. This will be the belt piece. Lay the fabric flat, folded at the shoulder. Cut the top layer in the center from hem to fold. Cut a neck hole about 3 inches deep and 6 inches wide. Measure down about 8 inches from the shoulder fold and begin stitching the side seams with a half inch seam allowance. Turn all of the edges and the sleeve holes under 1/4 inch, and another 1/4 then stitch in place. This finishes all of the edges. Turn the kimono right side out and measure down from the shoulder to the natural waist and mark that height. Measure in about 4 inches from each side seam at the natural waist and stitch two vertical button holes about 1 1/2 inches in length. Cut open the button holes, thread belt through from the inside to the outside. Cross front over and tie belt into a knot for the loose back style. For the criss cross tight style, put belt on the outside, cross the front, thread the belt ends through the belt loops on the outside and tie into a knot.